Paleontologists have discovered the exquisitely preserved brain in the fossil of one of the world's first known predators that lived in the Lower Cambrian, about 520 million years ago. The discovery revealed a brain that is surprisingly simple and less complex than those known from fossils of some of the animal's prey. The find for the first time identifies the fossilized brain of what are considered the top predators of their time, a group of animals known as anomalocaridids, which translates to "abnormal shrimp." Long extinct, these fierce-looking arthropods were first discovered as fossils in the late 19th century but not properly identified until the early 1980s. They still have scientists arguing over where they belong in the tree of life. The brain in the fossil, a new species given the name Lyrarapax unguispinus – Latin for "spiny-clawed lyre-shaped predator" – suggests its relationship to a branch of animals whose living descendants are known as onychophorans or velvet worms. These wormlike animals are equipped with stubby unjointed legs that end in a pair of tiny claws. "Our discovery helps to clarify this debate," said Nicholas Strausfeld, director of the University of Arizona's Center for Insect Science and lead author of the Nature paper. "It turns out the top predator of the Cambrian had a brain that was much less complex than that of some of its possible prey and that looked surprisingly similar to a modern group of rather modest worm-like animals." Onychophorans, which are also exclusively predators, grow to no more than a few inches in length and are mostly found in the Southern Hemisphere, where they roam the undergrowth and leaf litter in search of beetles and other small insects, their preferred prey. Two long feelers extend from the head, attached in front of a pair of small eyes. The anomalocaridid fossil resembles the neuroanatomy of today's onychophorans in several ways, according to Strausfeld and his collaborators. Onychophorans have a simple brain located in front of the mouth and a pair of ganglia – a collection of nerve cells – located in the front of the optic nerve and at the base of their long feelers. "And – surprise, surprise – that is what we also found in our fossil," Strausfeld said, pointing out that anomalocaridids had a pair of clawlike grasping appendages in front of the eyes. "These top predators in the Cambrian are defined by just their single pair of appendages, wicked-looking graspers, extending out from the front of their head," he said. "These are totally different from the antennae of insects and crustaceans. Such frontally disposed appendages are not found in any other living animals with the exception of velvet worms." The similarities of their brains and other attributes suggest that the anomalocaridid predators could have been very distant relatives of today's velvet worms, Strausfeld said. "This is another contribution towards the new field of research we call neuropaleontology," said Xiaoya Ma of the Natural History Museum in London, a co-author on the paper. "These grasping appendages are a characteristic feature of this most celebrated Cambrian animal group, whose affinity with living animals has troubled evolutionary scientists for almost a century. The discovery of preserved brain in Lyrarapax resolves specific anatomical correspondences with the brains of onychophorans." "Being able to directly associate appendages with parts of the brain in Cambrian animals is a huge advantage," said co-author Gregory Edgecombe, also at the Natural History Museum. "For many years now paleontologists have struggled with the question of how different kinds of appendages in Cambrian fossils line up with each other and with what we see in living arthropods. 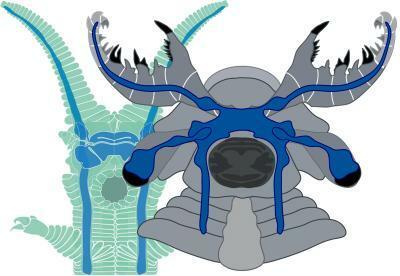 Now for the first time, we didn't have to rely just on the external form of the appendages and their sequence in the head to try and sort out segmental identities, but we can draw on the same tool kit we use for extant arthropods – the brain." 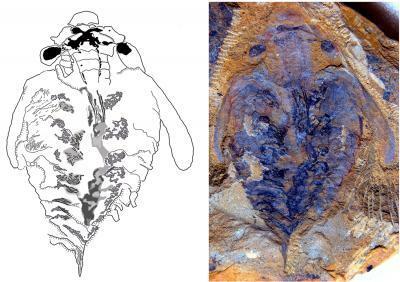 Strausfeld and his colleagues recently presented evidence of the oldest known fossil of a brain belonging to arthropods related to insects and crustaceans and another belonging to a creature related to horseshoe crabs and scorpions (see links below). This is a side-by-side comparison reveals the similarity between the brain of a living onychophoran (green) and that of the anomalocaridid fossil Lyrarapax unguispinus (gray). Long nerves from the frontal appendages extend to paired ganglia lying in front of the optic nerve and connect to the main brain mass in front of the mouth. Anomalocaridids had a pair of clawlike grasping appendages instead of feelers. "With this paper and our previous reports in Nature, we have identified the three principal brain arrangements that define the three groups of arthropods that exist today," Strausfeld said. "They appear to have already coexisted 520 million years ago." The Lyrarapax fossil was found in 2013 by co-author Peiyun Cong near Kunming in the Chinese province of Yunnan. Co-authors Ma and Edgecombe participated in the analysis, as did Xianguang Hou – who discovered the Chengjiang fossil beds in 1984 ¬ – at the Yunnan Key Laboratory for Paleobiology at the University of Yunnan. "Because its detailed morphology is exquisitely preserved, Lyrarapax is amongst the most complete anomalocaridids known so far," Cong said. Just over five inches long, Lyrarapax was dwarfed by some of the larger anomalocaridids, which reached more than three feet in length. Paleontologists excavating lower Cambrian rocks in southern Australia found that some anomalocaridids had huge compound eyes, up to 10 times larger than the biggest dragonfly eye, befitting what must have been a highly efficient hunter, Strausfeld said. The fact that the brain of the earliest known predator appears much simpler in shape than the previously unearthed brains of its contemporaries begs intriguing questions, according to Strausfeld, one of which is whether it is possible that predators drove the evolution of more complex brains. "With the evolution of dedicated and highly efficient predators, the pressure was on other animals to be able to detect and recognize potential danger and rapidly coordinate escape movements. These requirements may have driven the evolution of more complex brain circuitry," Strausfeld said. This photograph and corresponding drawing show the flattened, fossilized trace of the brain of the world's earliest known predator; the X-like structure in the head denotes the fossilized brain. Two dark round spots represent the optic ganglia with nerves that lead from the eyestalks into the head. The smaller, almond-shaped areas just in front would have innervated the creature's grasping appendage. The main brain region is in front of the mouth, giving rise to two nerve cords leading down along the animal's body.